I started watching the very first Pretty Cure series, or more accurately, I started watching it again. See, I watched the first two episodes a few months back, and then I was curious about the name of the monsters. I remembered that in Smile Precure, the name for the monsters, Akanbe, meant a rude face that is sometimes made by children. I was quite shocked and surprised that the name for the monster in the first Pretty Cure series was a bad word in Japanese, a REALLY BAD WORD! I will not repeat it, because it is a bad word. I stopped watching the series because of it, and I went back to watching the later series, Heartcatch, Suite, Smile, and DokiDoki. Last week, though, there was no DokiDoki Precure, and instead, the lastest All Stars Precure movie was aired. Even though it was first aired a year ago, I had not seen that movie, so I decided to watch it. It was really good, but really scary. I found Fu-chan a bit creepy, but I am glad that it all worked out in the end. Oh dear, I am going off on a tangent. In Precure All Stars, you get to see all the Precures from all seasons, even though it seems that it is the most recent two sets of girls that are featured. Most of the series involved the girls from Smile Precure and Suite Precure, which was fun. Still, we did get to see all of the girls, all the way back to Cure Black, Cure White, and Cure Luminous from the first Pretty Cure. So, I got curious. I started watching it again, and I think I can manage it if I think of the monsters as Curse Monsters, rather than their names. I really do not know Japanese well at all, only a few words here and there, so it does not bother me as much as it would if it was an English curse word. If you can get past the fact that the word is used, though, it really makes for an interesting moral and metaphysical statement. In the world today, people seem to use curse words like they are just normal words. It is strange. Even nice people swear; even grandmothers swear nowadays. People just seem to think it means nothing at all. In Pretty Cure though, the Curse Monsters are really nasty, and they do a lot of damage. 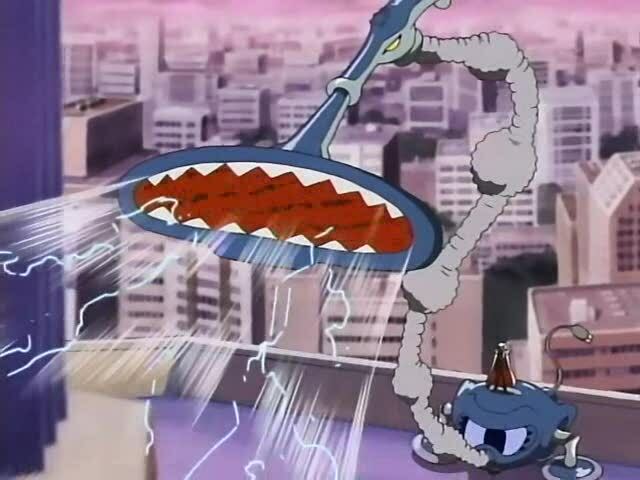 I just finished watching episode 2, and the villain made a Curse Monster out of a vacuum cleaner. The Curse Monster just sucked up all of the energy in the city to feed the side of Evil. That seemed symbolic to me, and it is often how I feel when people are swearing around me. It feels like all of the energy is being sucked up in the Aethyr to feed the side of Evil! I did like something else though. When the Pretty Cures purify the Curse Monsters, they stop saying the bad word, and instead say, “Gomenna,” which I think is an apology! I like that the Curse Monsters apologize as they are being purified. That seems very right too. So, I guess I am going to keep watching the first Pretty Cure. It is the only series that seems to be available on Hulu Plus, which I can get on my regular television. That is rather convenient. It is too bad that none of the others are available that way though. Maybe someday! I think we need to clarify this, because there is a huge amount of disinformation on this subject on the Web. It is as if West Tellurians have a visceral need for everyone to have taboo words just like theirs. The idea that they don’t seems to worry them almost as deeply as questioning their Darwinist Creation Myth. No doubt this is a psychological reflection on the importance of verbal pollution to a decayed culture (and how it isn’t actually as casual as it sounds, but is a sort of inverted need), but it would take us too far afield to go into that right now. The name of the monster in Futari wa Precure is ざっけなよ zakkenayo. It does not mean or remotely imply any bodily act or function, despite what a lot of people on the Internet confidently and stridently declare. Their declarations say more about them and the state of their culture than about the word. Now this is very offensive and does break a taboo, because the Japanese are civilized people and this is not the way you should ever talk to anyone. If you do it will cause deep offense. In that sense only it could be compared to West Tellurian body-language (to coin a phrase). But the comparison is much more confusing than helpful, and the bald and confident (why are West Tellurians at their most confident when they have no idea what they are talking about?) statement that it refers to a bodily function or is a “taboo word” in the West Tellurian curse sense is just false. It is clearly a word intended to show the fuwa or athamë (rejection of proper Harmony or Order) of the monster. This in itself is untranslatable, because in the West Tellurian mind the very concept of wa or thamë (proper harmony) no longer exists. Oh THANK YOU, Dolly-senpai! Yay! I can watch Pretty Cure without feeling guilty now. I am very happy about that. I am sorry for posting this when I did not know what I was talking about. Of course, if I was confused, many others must be confused too! So, maybe is it ok to leave the post up? I am going to include your comment in the text to my article, so that people do not need to go look in the comments to know the information that you have shared. Thank you, Cure Dolly. I would just add that gomen na is indeed an apology – rather informal and I suspect in this context intended to be a bit childish. It also makes a bit of a pair with the name, which also uses an informal “na”, though in a different sense. Here is a good essay on the psychology of cursing in West Telluria. PS – regard dictionaries, especially online ones, with great caution in this area. There are a number of Japanese words that they translate with offensive English ones, but the translations are not correct. They are intended to be “cultural equivalents”, but they really aren’t even that because the cultures/languages just work differently. Honored Cure Kiyoku, there is NO need to feel embarrassed. The Internet is full of misleading information on this word. The idea that there is a culture that does not curse (actually there are many) seems to hit an emotional gland with these people and set them talking confident and informed-sounding nonsense. It is a fascinating psychological reaction in itself I think. These people who are “shocked by nothing” seem to go into a blind panic when one of their fundamental ideas is questioned. And it is interesting to see which ideas are fundamental to them – and how vulgar and trivial they are! Yes, yes, please do leave the post up! Well, the embarrassment I felt was minuscule compared to the RELIEF I felt that my current favorite series of shows did not start with something so bad! I think that what I read was that it was the “social equivalent” of the bad word. That was terribly upsetting, I have to admit. So, I can happily watch with a clear conscience. YAY! I don’t think you have anything to be embarrassed about, Cure Kiyoku. It was really a very easy mistake to make. I made a very similar one, and as you know, I have been studying Japanese for quite some time! The word “kuso” is the one I had been rather confused about. My dictionary (a physical dictionary by a respected publishing house) translated it as quite a strong swear word, so as you can imagine, I was surprised to hear it used in Precure! However, Cure Dolly (she is such a smart Dolly, isn’t she?) explained to me that while it is a little on the rough side, it is certainly nothing like the curse words that it is sometimes translated into English as. Isn’t it sad that West Tellurians have to project their obsession with vulgarity onto everyone else?